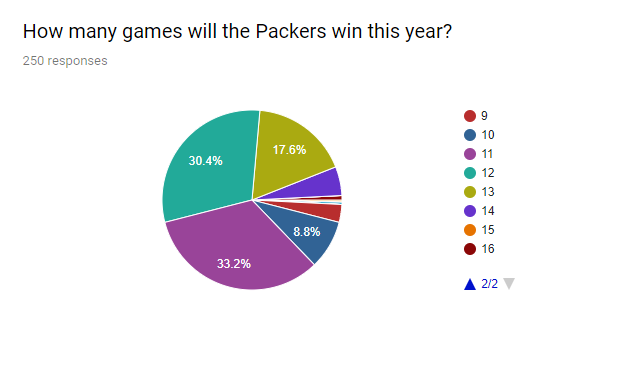 A couple weeks ago, I posted a survey on CheeseheadTV and Twitter (follow me @timbackes) asking fans to answer some simple questions about their expectations for the 2018 Packers. I promised I’d follow up on the opening day of training camps with results and analysis. Well, the joyous day that is the start of training camp has finally arrived. 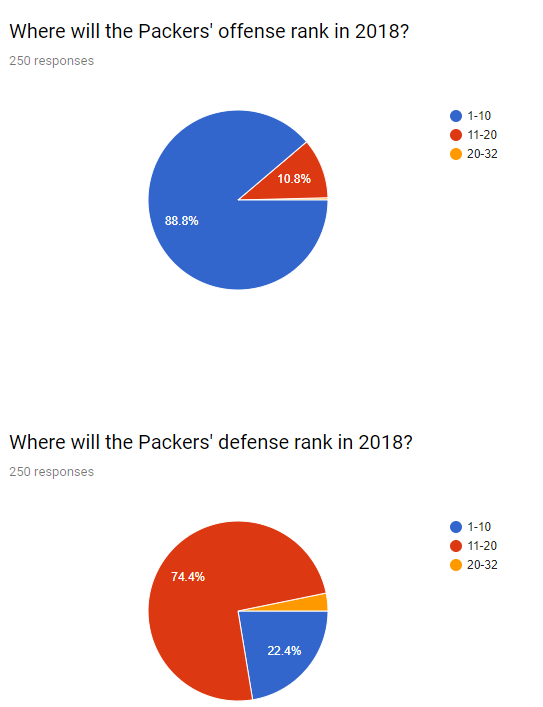 I’m pleased to report we had an even 250 people respond to the survey, which should give us some good insight into where Packer fans are at heading into the new season. For each question, we’ll take a look at the raw numbers then a bit of analysis. Packer fans generally seem to expect the team to win 11 or 12 games this year, a reasonable expectation assuming Aaron Rodgers stays healthy all year and the defense improves. It is worth noting that even with a healthy Aaron Rodgers, however, the Packers have not won more than 10 games since 2014, or three consecutive seasons, their longest streak without more than 10 wins since the five year period from 1990 through 1994. Taking the 2013 season into account, four of the last five seasons the Packers have failed to reach at least 11 wins, though that does include a couple big asterisks in Aaron Rodgers’ injuries. Eleven wins received a plurality of the vote, and we’re about to see where fans expect to see some trouble spots throughout the season. The Vikings being at the top of the list is not a surprise. They are the reigning NFC North champions, and Mike Zimmer’s defenses in both Cincinnati and Minnesota have historically given Aaron Rodgers a difficult time. The Vikings are expected to once again have one of the league’s best defenses, especially in the pass game lead by a true shutdown corner in Xavier Rhodes. What was interesting to me was that more people think the Rams are a bad matchup for the Packers than the Patriots. I actually agree with this, but I suppose I figured the Patriots’ name and mystique would have garnered them some more votes. Assuming Aaron Donald isn’t still holding out by the time the Packers and Rams meet, they’re going to have a heck of a time controlling that front. Plus, the Rams have added even more explosiveness to an offense that already created a lot of big plays in 2017. Assuming Jared Goff continues to make strides in the right direction, this is a Rams team that could be dangerous this year, and would pose a real threat to the Packers in January in addition to their regular season meeting. The Atlanta Falcons had a down year in 2017 compared to their showing in 2016, with former offensive coordinator Kyle Shanahan’s magic touch missing from the team’s previously dominant passing game. But if the team gets that spark back, it could once again prove to be a thorn in the Packers’ side. 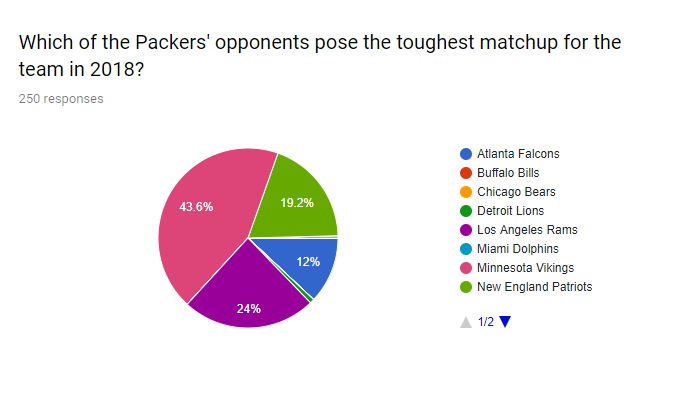 For as negative as Packer Twitter can often seem, a majority of poll respondents are feeling quite positive about the Packers’ chances this year, with more than half expecting a Super Bowl victory, and nearly three quarters of respondents expecting the Packers to at least make the conference championship. 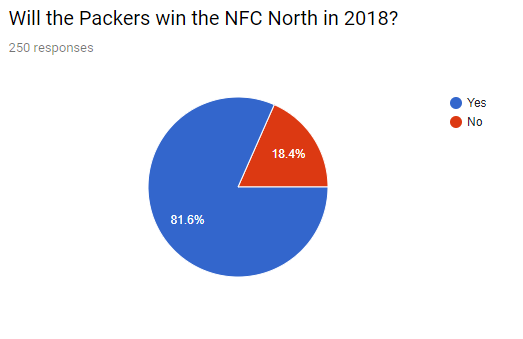 No surprise here, as an overwhelming majority of voters expect the Packers to win the division. Even less surprising were the results of the next question. 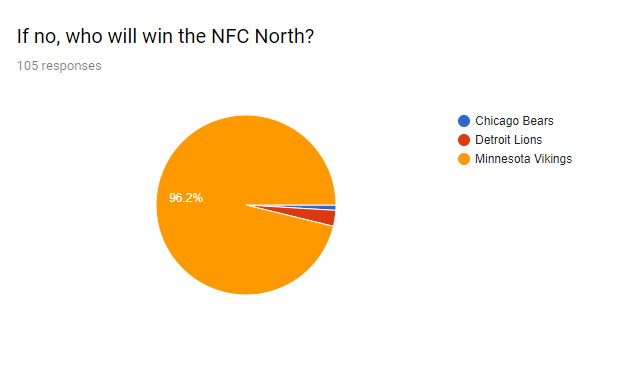 There was only one voter who voted for the Bears, so clearly we had at least one Bears fan taking the poll… probably the same person who said the Packers would only win three games this year. Otherwise, the expectation is clear… if it’s not the Packers, it’s going to be the Vikings again (God forbid). This is the set of questions I was most interested in seeing the responses to. 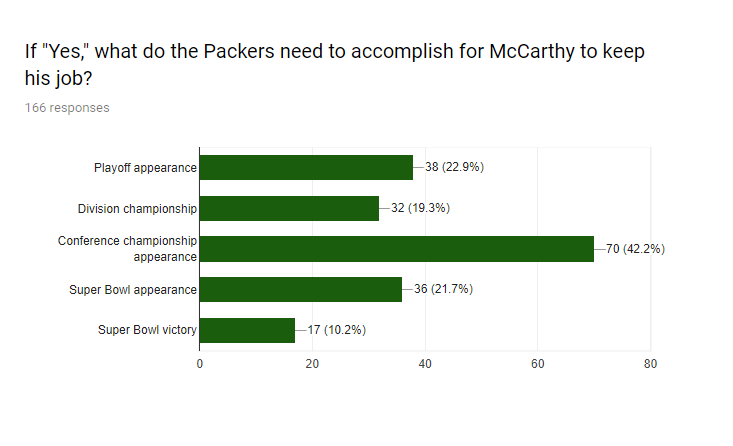 A little over half of Packer fans responding to this poll say this season will be pivotal in determining whether McCarthy remains with the team moving forward. Obviously, this doesn’t give us any insight into what Mark Murphy and Brian Gutekunst think, but it at least gives us the pulse of Packer fans on the subject. There is no denying the success Mike McCarthy has had with the Packers, including numerous division championships, an extremely winning record and a Super Bowl ring. But that Super Bowl was nearly eight years ago now, and perhaps after Rodgers’ injury last season, fans are beginning to pay a bit more attention to the hourglass ticking away the time left in his career. If the Packers underperform this year, we can likely expect the loudest calls yet from the fans for McCarthy’s job. Whether the Packers would comply is anyone’s guess at this point. 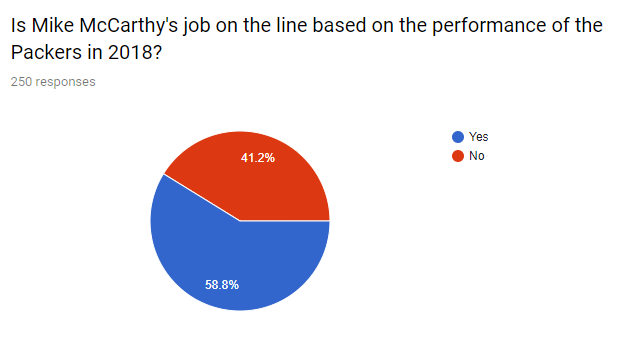 The follow-up set of questions indicates a plurality of fans would be placated by at least an appearance in the conference championship, but there are those who would not settle for anything less than an appearance in the big game if McCarthy is to keep his job. The offensive figures here are no surprise. If Aaron Rodgers stays healthy and the running game is as strong as many people believe it will be, there’s no reason to think the Packers can’t have one of the better offenses in football. On the defensive side of the ball, there are some who believe the Packers will take a massive leap to become a top-10 unit in 2018. The vast majority, however, see the Packers making some marked improvements on that side of the ball this year, but do not expect them to become an elite unit. That seems reasonable to expect to me, at least. I received hundreds of responses to the optional questions, so rather than providing the exact figures, I thought I’d give you some of the general trends I noticed. Q: Which one player will be the biggest (positive) surprise in 2018? The four most common names in this category (all of whom were mentioned at least 10 times) were Kevin King, Josh Jones, Reggie Gilbert and Josh Jackson, which means people are especially looking forward to pleasantly solid play from the Packers’ young secondary. Gilbert was a preseason darling in 2017 who did not get a whole lot of action in the regular season. If he does end up being a positive surprise this season, it’ll be good news for the Packers’ pass rush, which has been the subject of much consternation among Packer fans this offseason. Many players appeared at least once, but others that had at least five mentions included Randall Cobb, Vince Biegel, Geronimo Allison and Jimmy Graham. Q: Which one player not named Aaron Rodgers will be most vital to the team’s success in 2018? By far the most frequent response to this question was Davante Adams, whose name was mentioned almost 40 times as the response to this question. Indeed, with the departure of Jordy Nelson, Adams will be leaned on more heavily than ever in the passing game, though hopefully the addition of Jimmy Graham should take some of the pressure off. Still, in the past, the Packers had both Nelson and Adams who were gifted at working the sideline. It remains to be seen if any of the other players in the horde of receivers currently on the Packers’ roster will be able to provide anywhere near the same value in that part of the field. Other frequent mentions here (10 or more) included Kevin King, Jimmy Graham and Kenny Clark. The King answer is a good one—if he has a great season, it will help out the secondary tremendously, as the team won’t have to rely on its rookies and an aging Tramon Williams, who can be a solid role player at this stage of his career but will mostly be looked to for his veteran leadership. Graham will also certainly have a lot of potential importance if he’s able to take some attention off Adams and Cobb and open up the middle of the field for the team. He also gives Aaron Rodgers a big-time red zone threat, which will help fill the void left by Nelson. Clark was the Packers’ best defensive player in 2018. At just 23 years old, he’s poised for great things in the league if he continues to improve along his current trajectory. Q: What are you most looking forward to about the Packers’ 2018 season? The most frequent theme here was some form of fans looking forward to an improved defense led by new defensive coordinator Mike Pettine (or, perhaps more accurately, anybody not named Dom Capers). People noted they are not just excited to see defensive improvement, but they are looking forward to seeing the specific schemes employed by Pettine and how he’ll use the players he has at his disposal. If you made it this far, thanks for tuning in and reading these results and analysis. It’s finally football season once again, and for the next six months we get to soak it all in. I know I'm pumped for it all to get started. Enjoy the 100th season of the Green Bay Packers! Don,t belive in charts play the games then talk . Think you missed the point, Allan. These are CHTV readers' expectations/predictions for the season, nothing more. Charts are real. I've seen them. 61 owes you at least one cookie for that retort. 61' I'd like a green cookie with butterscotch chips please. You saw the title right? If you don't want to read it then don't click. Healthy Rodgers plus improved defense should bring us to the promised land but you just never know , with Capers being gone many years too late that is a positive right there for the defense , if no serious injury bug this year MM has to get it done , no excuses this coming season . He should be on the hot seat. We are definitely Homers, but some of the polls are not to unrealistic. Go Pack ! That was a lot of work, ty Tim. Nice job Tim. -- Albeit maybe a few too many numbers. "assuming Aaron Rodgers stays healthy all year"
The key to season 2018. --- With AR, maybe 10 or 11. Without AR for too many games, maybe 8 or 9. This is the season for MM. --- If he can't finally prove he's a genuine NFL HC, he's gone. --- I fear a new HC in 2019. I think he has been gifted a grace year. With the other coaching and leadership changes, there are some expected growing pains. Unless it is a crash and burn year, under .500, I think he is safe. If we are anywhere near 8-8 this year, next year will be make-or-break. With Rodgers the Packers range should be anywhere between 10-13 wins. This year if they stayed healthy and the defense performs well I think they could be in the 12-14 wins. I think this years theme will be addition by subtraction. Subtract Capers and Hundley equals additional wins.